Cort and Reid are celebrating 7 today. Here's a recent picture from when I took them to get back to school haircuts. They both wanted mohawks and crazy colors dyed in. Fortunately, we were at a place that didn't do dye. But they did get mohawks. Happily, under all that hair glue, their hair is fairly clean cut. Throughout the year I do their haircuts myself to save money, so they always enjoy getting to have a professional cut right before school. And I confess I like having a break from doing the haircuts myself. Second grade, here they come! Good Morning, Lisa. I love this picture! Happy Birthday to the twins. When I was their age a Mohawk was a bit more radical. 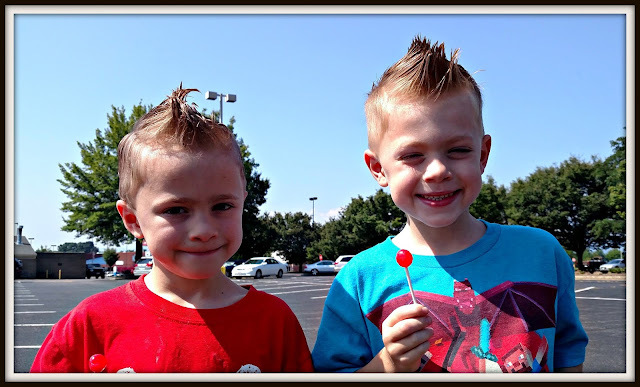 Mohawks are all the rage to impress the little chickies in second grade I hear too. Especially green ones!!!! So they knew what they were asking for. Yay, Happy Birthday, Cort snd Reid!! I hope they have a great birthday. I like those mohawks. I saw a little boy yesterday who had one. Adorable as always- they are sure growing up fast! Happy 7th birthday to your sweet boys. LOVE the "fauxHawks"! I imagine with back to school shopping, and 2 birthdays this time of year gets pretty expensive for you. They are beautiful children! Mica turns 11 on Wed. They grow up so fast! You boys look great! Happy days always! I kept asking myself, where had I seen that look before. Then I remembered, it was Dr. Seuss! Thing One and Thing Two. Nice looking kids, those boys. Oh my gosh, they are both just cute as a button!! I do not like Mohawks. BUT on them it is just adorable! I want to squeeze them and pinch their cheeks like an old aunt. I have never heard of hair glue! I guess it is several steps up from hair spray. Your Mohawks are very handsome. Hope your day is filled with many blessings and spoilings. Lookin' good on the Big 7! Happy Birthday, guys! Their haircuts are sooo cute! Woo hoo! Happy birthday to the sharp-lookers! They both do look cute in the Mohawk hair style. Happy birthday to the boys! Hip Hip Hooray, it is a double special birthday day!!! Fun hair-dos and some cute boys. Thanks for the suggestion of The Little Bookstore of Big Stone Gap. I am enjoying it and have The Magicians on the back burner! They look cute with their new haircuts. Here's wishing them a wonderful upcoming school year. Oh my gosh. Seven? Impossible. Happy belated. I can't believe they're seven!! !